You could have lived just about anywhere in the 1970s and heard about interesting, if not downright impressive, UFO sightings. We've explored the seventies often in these pages, and here's another drawing of something strange. The object depicted was seen low in the sky by at least two witnesses in Central New York, and as it slowly cruised overhead it made a repetitive sh-sh-sh noise. The top appeared to have red, blue and yellow lights, while the bottom displayed a white fluorescent light all around. 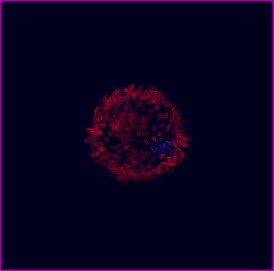 Eventually, the object shot away at fast speed. Witnesses claimed that anything resembling a helicopter was out of the question. The old couple had read about this sort of thing before, and they stood engulfed in terror as events began to unfold. Yes, as years passed each had read about encounters with strange beings and situations, and now it was happening to them. The old woman shuddered as alien hands grasping peculiar instruments explored her body, inch by inch. "Why, oh why are you doing this to me?!" she screamed. "Who are you?!" She thought instantly of Betty Hill, whose account of helplessly enduring a probe from head to toe was horrifying. And now it was her turn. Her husband, a couple of years older than she but no less frightened, thought immediately of the two fishermen in Pascagoula, Mississippi who claimed to have been examined with a device that looked like a large eye. This time, there was no "eye," but he knew all too well that something incredible, technology he couldn't even imagine, was systematically examining him. At last, the weird procedures having been completed, the two old people were reunited, and each hugged the other so tightly that no force in the universe would ever separate them again. However, their moment of presumed serenity was shaken as a human-like voice whispered in their ears: "Okay, you're all set. You folks can proceed to your flight," advised the TSA agent, rushing off to scan other airline passengers waiting impatiently in a long line. Another old couple, stepping forward as security personnel beckoned them on, also remembered reading about this sort of thing before, and they, too, stood engulfed in terror as events began to unfold. One of them remembered reading about the Travis Walton case, when strange beings had descended upon him and. . .
As a teenager, exploring books about UFOs fascinated me, but I was also always on the lookout for magazine articles about the subject which had become classics. In March of 1967, I bought a used copy of Reader's Digest from a mail-order place in California. It was, looking back, $2.50 well spent for the July, 1952 issue. Though sharply abbreviated, RD had taken notice and re-published the all-important article from LIFE Magazine of April 7, 1952 entitled, "Have We Visitors From Space?" LIFE's report (influentially written by H.B. Darrach, Jr., and Robert Ginna and eventually spotlighted briefly in the 1956 documentary motion picture, "U.F.O.") was the culmination of official and public concern over widespread flying saucer reports, including Kenneth Arnold's sighting, and extending to far more dramatic encounters. In addition, the Digest included James R. Aswell's piece, "Flying Saucers -- New in Name Only," which asserted that UFO reports went back to at least the 1800s. 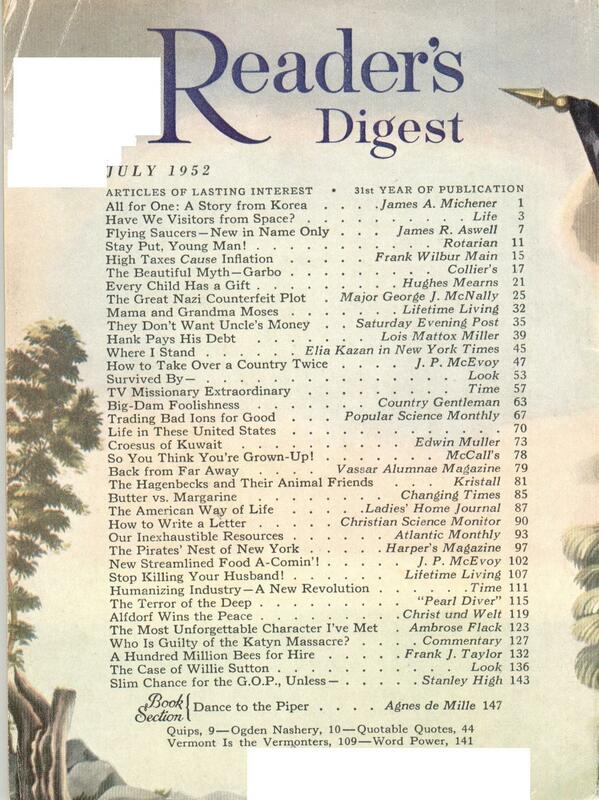 More to the point for me, however, was the RD issue date of July,1952. Though published in June, the cover date of July would coincide with the famous month and year when UFOs were detected on two dramatic occasions, bolstered by radar and visual contact, over Washington, D.C. Just holding this 1952 summer artifact in my hands brings home the realization that the nation, for a time at least, became vitally concerned about the UFO mystery -- as well it should have -- and, as we now know, there were "higher up" conversations about telling the people of official fears that the UFO enigma represented extraterrestrial contact. Instead, lucky us, we got the Robertson (CIA) panel convening in 1953 and enough subsequent information suppression over the decades to keep the public in the dark indefinitely. But, okay, folks wanted to know about UFOs in 1952. What else was on their minds? Reader's Digest is a reliable time capsule, often reflecting the daily lives and concerns of just plain us. The July issue held, for instance, author James A. Michener's commentary about a tragic American military loss during the Korean conflict, with RD sure to mention in a footnote that Michener's words, based upon a newspaper account which reached him while visiting Korea, were released to news agencies throughout the U.S. Far East Command. Another writer advised people to stay rooted in their communities and not to rush off to other places just because the grass always seems greener elsewhere, while yet another warned the country that high taxes cause inflation. Accountant Frank Wilbur Main stated, "Public pressure was largely responsible for holding the tax bill of 1951 to an increase of approximately 5.6 billion dollars, instead of the ten billion dollars requested by President Truman." Pocket change in 2010. The good old days. "An article a day of enduring significance, in condensed permanent booklet form," was the Digest's slogan of the day, utilizing by 1952 some 35,000 "community representatives" across the nation to sell subscriptions to the little magazine which emphasized family and religion with no apologies. What else mattered in the July, 1952 issue? There's a piece about actress Greta Garbo with comments from people in high media places who knew her, including comments from the late columnist Dorothy Kilgallen, whose own (untimely) death and reputation attracted controversy among the conspiratorial. Right out of history, there's motion picture director Elia Kazan, writing about Communism's threat and his appearance before the House Committee on Un-American Activities -- and his testimony subsequently lost him many friends among the, um, Communists basking in the Hollywood community. Counterfeiting of British money by Nazis during WW II made the pages, as did pleas for smaller government and less people on the public dole. An article on Batista's Cuba. Batista? Wow, that was a long time ago. "Will Batista give Cuba an honest, efficient government -- or another fast shuffle?" asks a blurb atop the page. Hmm. I think I can answer that. Starts with F for Fidel. . .
Bishop Fulton J. Sheen. Sure, I remember watching his TV show on the old family black and white TV, even though I'm no way Catholic (I watched Liberace's show, too, but don't play the piano or dress in sequins). I believe that actor Martin Sheen borrowed his own name from the Bishop, otherwise he would have remained Martin Estevez (sons and actors Emilio Estevez and Charlie Sheen are named after. . .well, now you know. . .). 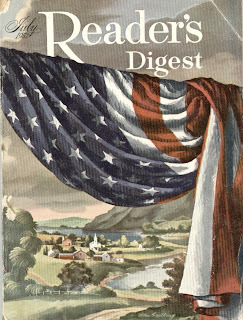 This Reader's Digest issue also questions the wisdom of attempting flood control with dams. They were on to something important there. A report about ion-exchange resins? Oh, water softeners, okay. . .
Kuwait. Wealthy beyond belief thanks to oil. And. . .? What? Butter vs. margarine? That debate was going on even in 1952? Endless. Then there's a piece entitled, "How to Write a Letter," and almost 60 years later I've every confidence that most of those who live almost totally in a world of texting wouldn't know how to write a reasonable letter if instructions regarding its preparation came with microwave instructions. Surprisingly, even back then there's a piece about natural resources, though exhaustible, that should be converted into inexhaustible resources. Looks good on paper, anyway, and I'm writing this much too late at night to figure out what the author is saying. Then we have a warning about mob rule in NY City. Looks pretty tame in comparison with today's social horrors. Pre-cooked and frozen foods had recently become important to the U.S. military (particularly the Navy), whose food preparation areas were previously burdened by garbage, bones and other substances difficult to get rid of -- and often a clue to the location of Naval vessels if left behind where enemies could track tell-tale trash. "Stop Killing Your Husband!" begs another article, condensed from a health magazine. "The typical husband," advises the author, "tends to put on weight as he grows older because he needs less food and often eats more." Like, wow. I guess some things DON'T change after all. Reminds me of that debate about margarine vs. butter. Making industry more productive by putting the human element into factory work is encouraged in another article, essentially telling management not to make useless jobs seem, um, as useless as they really are. Speaking of jobs you may not like to do, a pearl diver writes of his dangerous encounter with a giant octopus. Beware, diver dude, by 2010 we know there's more intelligence in an octopus than one can comfortably entertain. Nostalgia? A piece glowing about the benefits provided by the easy availability of hundreds of millions of honeybees in the U.S. stands in sharp contrast to the current day, when bee colonies all over the country mysteriously lose their valued occupants quickly and completely. As if reverse deja vu by decades, an article near the end of this 1952 issue suggests the Republicans will have a tough time defeating the Democrats. I guess they needed the Tea Party and a witch to run back then, too? Political talk. I am not a Communist. I am not a crook. I am not a witch. I am not gay. One trouble with politics is, there's always more I'm not than I am. Obviously, people did attempt to enjoy, tolerate or avoid all that life had to offer 60 years ago and, just like today, unfortunately, despite the evidence and despite the furor, intense public interest in UFOs came and went faster than dysentery on a cruise ship. 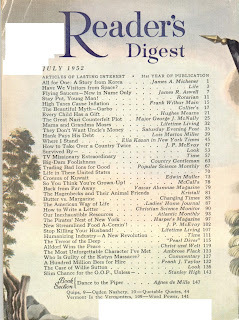 Nevertheless, imagine the tremors felt throughout the faithful Reader's Digest (and LIFE) readership when July, 1952 rolled around, providing even more excitement than the April 7 LIFE Magazine blowout. This is an oldie intended primarily for those of you too young to remember oldies. When this Associated Press photo and blurb began making the rounds, probably in the late fifties or very early sixties (Jung died in 1961) it was referenced by numerous media and UFO research sources. Psychologist Jung, having already written a book about "flying saucers" and attempting to connect reports about the phenomenon to archetypes, eventually started to embrace a far more "alien" explanation. You may be assured that most students of psychology and Dr. Jung are unaware of the famed psychologist's evolvement regarding the UFO issue. Now who's crazy?